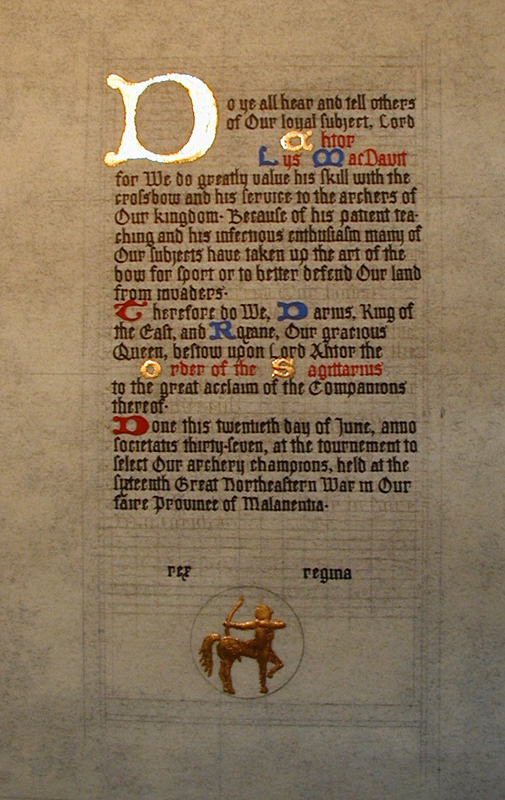 Once an assignment to create a scroll is accepted, the scribe uses all available information about the award and the recipient to create a special document, and begins to plan it. 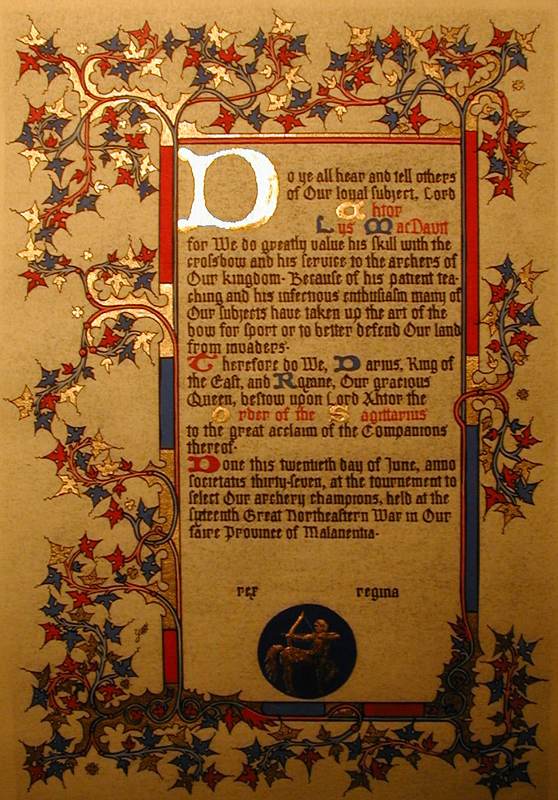 More than one College of Scribes volunteer may be involved, as it is very common for different people to create the wording, do the calligraphy, and decorate the piece. 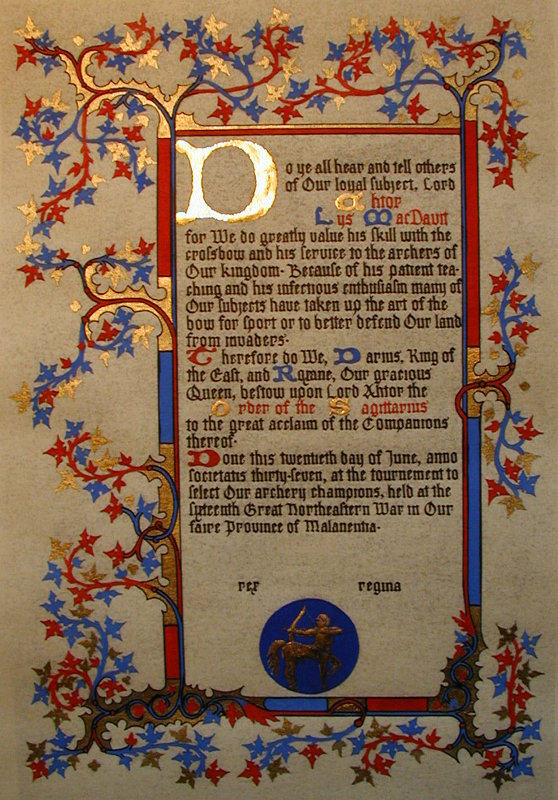 The scribe(s) uses their own paper or parchment, ink, paint, gold leaf and other needed materials; there is no reimbursement to them for these out-of-pocket expenses. There may also be considerable cost for packaging and postage, both to get a finished scroll to the proper people before it is needed, and to transfer a work-in-process from one participant to another. And, of course, there is the time each scribe spends to research, plan and create the scroll – for elaborate pieces, this can run to a hundred man-hours or more. Really. 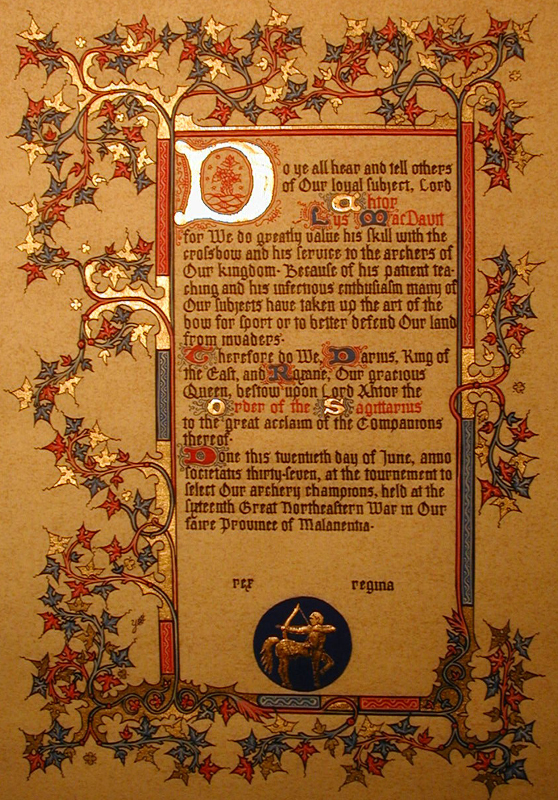 Occasionally, circumstances may result in a scroll not being presented when an award is bestowed in Court. If it is not simply a rare logistical failure in getting a finished scroll into the right hands in time, a backlog scroll assignment is set-up, and the scroll is given to the recipient when it is finished. There have also been several cases where the College of Scribes has replaced scrolls lost in home fires and floods! There is a Backlog Deputy whose job it is to keep track of such needs, so anyone lacking a scroll for an award should submit a request to that officer; there is also a list of completed backlog scrolls for which recipients are being sought — perhaps you or someone you know is listed, and you can help a scroll get to its intended destination! Please consider the use of the word “scribe” to mean whatever artisan is involved in creating the item which commemorates an award. It has become increasingly popular for items other than traditional “scrolls” to be presented; rune stones, embroideries, inscribed tools and weapons, carved drinking horns, stained glass panels, and many other treasures have been created for award recipients. Whitework and rubrication done, scroll complete! Woot! Thank you, Ygraine! And thanks to all the scribes of the East Kingdom!